KEPPI KETO has a mission to deliver the highest grade MCT oil on the market. We have worked tirelessly to offer premium products in order to boost energy, create heightened focus and maintain healthy weight management. PROMOTES WEIGHT MAINTENANCE & ALL-DAY ENERGY BOOST through thermogenic effect. MCTs are burned by the body for fuel, rather than being stored as fat. Medium Chain Triclycerides are full of healthy saturated fats that support appetite regulation and decreased food cravings. 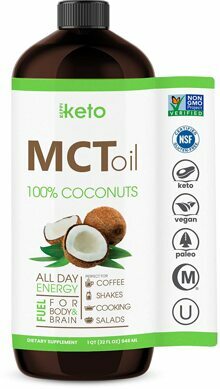 Concentrated MCT Oil is about 6 times stronger than eating simple coconut oil, providing instant and sustained energy as well as enhanced focus and concentration. It is also certified gluten-free, non-GMO and vegan friendly. 30-DAY MONEY-BACK GUARANTEE ensures your satisfaction. If you’re not impressed with the improved energy and focus resulting from this entirely odorless and flavorless product when adding it to your coffee, shakes and salads, we will refund 100% of your purchase price. ALL-DAY ENERGY BOOST comes from concentrated 100% Coconut Oil, known as MCT Oil. MCTs travel straight to the liver, providing instant and sustained energy as well as enhanced focus and concentration.